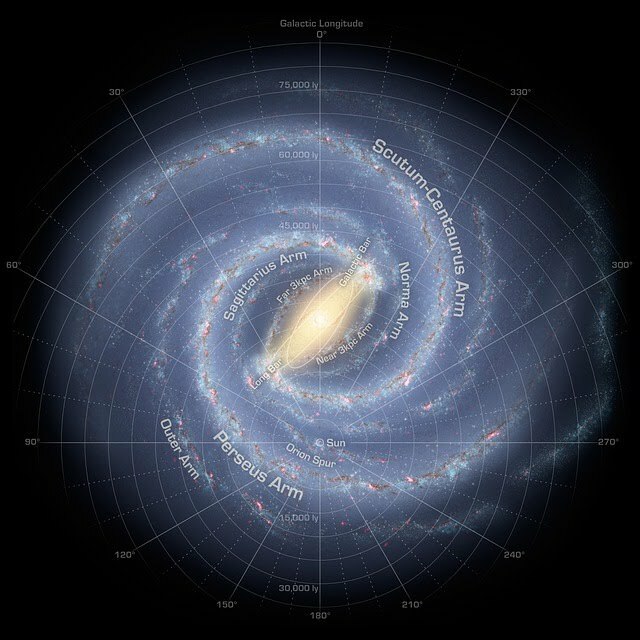 Do we not want to know where our Earth and Solar system is located in the milky way galaxy? The picture on the left gives an accurate map of milky way and where our solar system is located. The stars are arranged in spiral arms around the galactic center. The galactic center is believed to contain a super massive black hole. Our solar system is located somewhere between the galactic center and the outer edge. We belong to the Orion arm named after the famous constellation in night sky. The Perseus arm and the Sagittarius arm are our neighbors in the milky way galaxy. When you see a stunning picture of milky way arm as seen from a dark location on Earth, you are most definitely seeing one of these two. Most of the stars that we see in the night sky actually belong to just the Orion arm. The individual stars in the nearby arms are difficult to see as individual stars. The picture on the left is an illustration and not a photograph. We should be able to send a space craft beyond milky way so as to take a photograph like this. That is not possible with the available technology and it does not seem possible for the next million years. This illustration is a result of painful mapping of each and every star that we see in the night sky. When we use a computer model to plot the map of milky way galaxy, we would know where our Earth and solar system resides in it. Assume that we are brought up inside a palace right from our childhood and we had never ever stepped out once. So we would not have seen the palace from outside even once. It is very difficult for us to visualize how the palace would look from outside in such a scenario. But since we know the interior shape of the palace, we can guess how the exterior would appear to someone standing in front. Getting an idea of how milky way is equally challenging but can be done if we can map all or most of the stars in the milky way. The above picture was done with this kind of complex mapping.